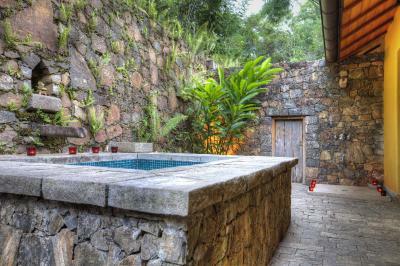 Lock in a great price for Living Heritage Koslanda – rated 9.1 by recent guests! Everything! Our stay was such an incredible experience. Our Forest Pavilion was everything we hoped it would be (we were even treated to a visits from a number of monkeys). The small number of rooms mean that it really feels like an escape from modern life. The facilities are all impeccable and the on-site waterfall is definitely worth a visit (we had it all to ourselves for a whole morning). The staff are attentive and friendly. The food is delicious and the curries on the Sri Lankan evenings were some of the best we had in our whole trip. The area is stunning, the rooms are super comfy, and the staff are great. All around amazing. 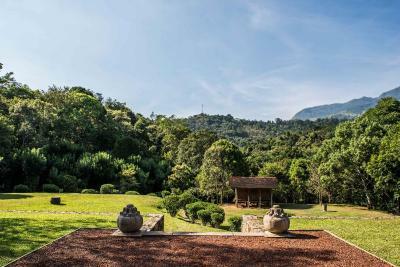 Nature, location, privacy, monkeys playing in the trees, infinity swimming pool, customer service, food, views from the forest pavilion and the goes on! Outstanding location and views from the villas. The whole property was beautifully manicured and all details looked after. Staff were friendly and infinity pool was divine. 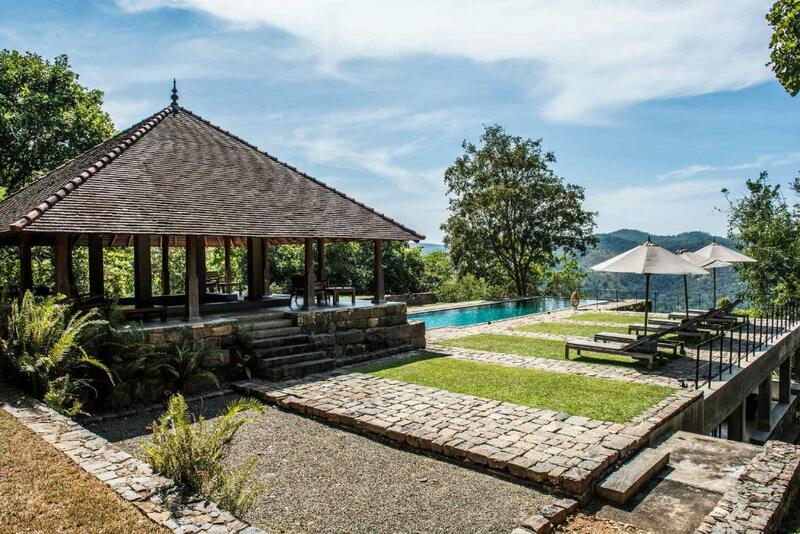 This property is truly special and felt like a holiday in a holiday during our visit to Sri Lanka. It's one of the most magical places we have ever been and was wonderful for children to run around and enjoy the grounds. I can't recommend it enough!! Living Heritage was EVERYTHING and more!! I fell in love with the grounds, the attention to detail, the dinner was excellent also. Johnson was attentive throughout our entire trip and the room and grounds were immaculate and everything I wanted. It was a peaceful and serene retreat and I wish I stayed longer! The road to get there needs serious work but its an oasis once you arrive!Would definitely recommend if you want to unwind and be at one with nature. Where to start..? Living Heritage Koslanda is a Dream come true envisioned by a filmmaker from Sri Lanka and his British wife. And you can see how these two creative, sensitive spirits turn the wilderness into pure joy & beauty. Every single corner has been thoughtfully designed. We stayed in one of the tree houses for two nights and enjoyed the experience so much that except for a sunrise trip to Lipton‘s seat we didn’t leave the resort. The rooms are simply dreamy and at night it’s cool enough so that you can tuck yourself into a cosy bed and sleep to the sounds of the forest. The pool is so beautiful and has such great views that you just want to hang out there. And there are many corners within the property to go for a stroll. Lastly, the food and their wines offering is probably one of the best we had in Sri Lanka so far. Very nice to be greeted each night with cocktails and snacks before dinner! Thanks again to Johnson and the rest of the team for everything! By far the best place I have ever stayed, let alone the best place we stayed in Sri Lanka. We had one of the treehouse pavilions which was just the most wonderful experience, waking up literally immersed in the sounds of the jungle with the most beautiful views imaginable. We had a rest day within the hotel grounds between our two nights here - we relaxed by the pool and walked to the properties waterfall (which we had to ourselves - just magical). The food here is delicious, and at breakfast they always serve a Sri Lankan delicacy you might not otherwise have found out about. I can't recommend this place enough, and I can't wait to return for a longer stay so that we can explore the numerous hikes in the area. 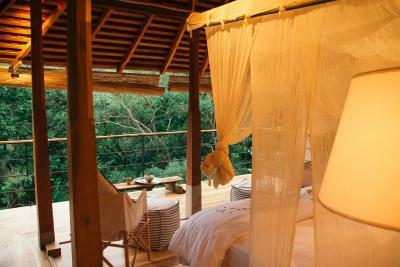 The peaceful location and treehouse style rooms were just perfect for a romantic trip. We loved everything about this hotel....the private waterfall, infinity pool with fabulous views, monkeys greeting us as we woke up and the delicious meals from breakfast to dinner. The very friendly staff and little touches of a flower necklace on arrival and bouquet when we left made this all a truly memorable experience. Thank you to Johnson and all your team. 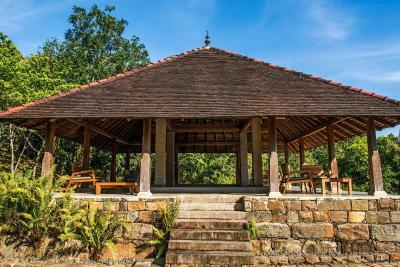 Featuring an outdoor swimming pool, garden with BBQ facilities, Living Heritage Koslanda offers elegant rooms in Koslanda, 0.6 mi from the Diyaluma Waterfall. WiFi is available in some areas of the property. With garden and mountain views, each room is equipped with a flat-screen TV with DVD player and a mini-bar. The private bathroom comes with a shower, free toiletries and hairdryer. Some rooms have a spa bath. The restaurant serves characteristic Sri Lankan food and International classics. The Adisham Bungalow is 20 mi from Koslanda Living Heritage, while Idalgashinna Train Station is 23 mi away. This property also has one of the top-rated locations in Koslanda! Guests are happier about it compared to other properties in the area. This property is also rated for the best value in Koslanda! Guests are getting more for their money when compared to other properties in this city. When would you like to stay at Living Heritage Koslanda? Featuring free Wi-Fi, garden and mountain views, this double room is equipped with a flat-screen TV with DVD player and a mini-bar. The private bathroom comes with a shower, free toiletries and hairdryer. Featuring free Wi-Fi, garden and mountain views, this suite is equipped with a flat-screen TV with DVD player and a mini-bar. The private bathroom comes with a spa bath, free toiletries and hairdryer. Please note that children cannot be accommodated in this room. House Rules Living Heritage Koslanda takes special requests – add in the next step! Living Heritage Koslanda accepts these cards and reserves the right to temporarily hold an amount prior to arrival. Sheer curtains could have used a clean. The staff! And all in all, this is a unique, comfortable, peaceful haven. The road to the resort needs serious attention!!!! A bit difficult to find - but easy if you follow Google maps & ask the locals once you are there. Nothing. The fact that the property a little hard to find is part of its charm! Staff lacking friendliness and enthusiasm for what they do; room cleanliness mediocre; hard to get to and staff hesitant to help when stuck with driver on last meters of steep unpacked road to the property. This was not a problem for us, however being in the forest they are quite a few bugs (and a little frog next to my bed in the morning) which some people might not like. However we did forget our deet spray and we did not get bitten! Grounds are absolutely stunning. We stayed in one of the forest pavilions, which was amazing; balcony over looking the mountains. Beautiful pool, also over looking the mountains. Very quiet; not many rooms so lovely and relaxing. We went on the waterfall walk; we were the only 2 people at the waterfall which was special. We went for pre dinner cocktails before dinner by the pool which was lovely as got to know the other guests. We 100% recommend and go again and again! The lunch menu is limited and service up at the pool a bit erratic. The Forest Pavillions are a great experience - wonderfully quiet and connected to the surrounding landscape. The pre-dinner cocktails were a great way to meet other guests and relax. The pool is amazing.